I cooked spaghetti the other night and saved the stewed tomato and mushroom cans and created containers for my q-tips and brushes. Forget buying containers . . .make it yourself with something that would typically be thrown away. It sure saves a lot of money and it's a lot prettier than a plastic container. To create these altered cans/container. . .it's preferable that you use the type of can opener that cuts the lid from the outside as opposed to the ones that cut on the inside. The cut is cleaner and you can recycle the lid so if you wanted a cover for the container, you are able to alter it as well. In this case I did not keep the lids. Measure the height of your can. Cut a decorated cardstock (rubber stamped) or scrapbook paper using your measurement. Glue on to the can. You may apply decoupage to the scrapbook paper to protect it from the elements but it is optional. That's it. Simple and economical. 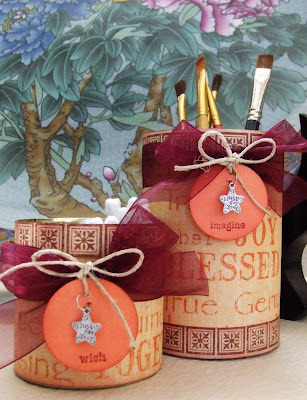 I kept my altered cans simple because I really liked the design of the scrapbook paper and didn't want to cover it up. I did not decoupage the cans that I made because I really didn't need them protected from the elements but in most cases, it's a good idea to do so. Decoupage is water resistant. Try it out and don't forget. . .save those cans!! Love the altered cans. I have two cans sitting on my counter just waiting for me to alter them. Thanks for sharing your creativity.